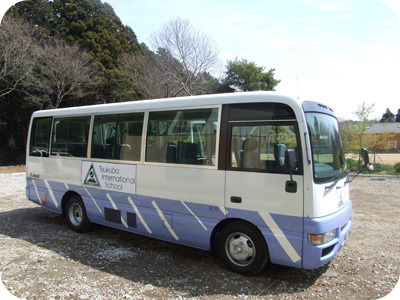 Tsukuba International School has a school bus that picks children up and drops them off at various convenient locations in Tsukuba, and Tsuchiura. Double click on the map to zoom in and see the exact pick up and drop off spots. Please note that these times are subject to change according to traffic conditions. We also offer a separate bus service at 2:00pm for pre-kindergarten students only. Please contact the school manager if you are interested in using this service. Please see our “School Fees” page for information about the bus fares. The school has a mailing list for parents whose children ride the bus. If the bus is delayed, an email is sent to the list to inform parents of the situation. Parents are encouraged to subscribe their cellphone email addresses to the list in order to receive instant information about the bus.